It's Autumn! 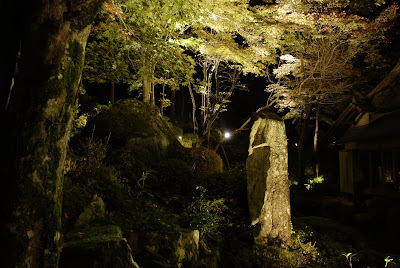 Grab yourself a tripod and your camera and take an evening drive up to Kyourinbou, located in Azuchi-cho, Shiga. Kyourinbou sits at the foot of Mt. Kinugasa, and is part of the Kannon Shoji temple. 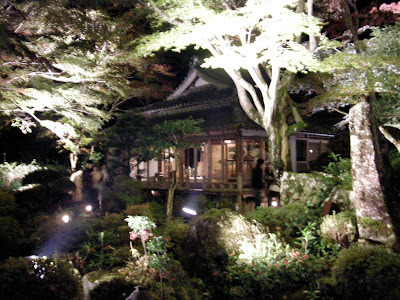 It's garden was designed by Kobori Enshu, a prominent figure in early Edo arts. If you catch the grounds at just the right time of year you'll be rewarded with some great photos. 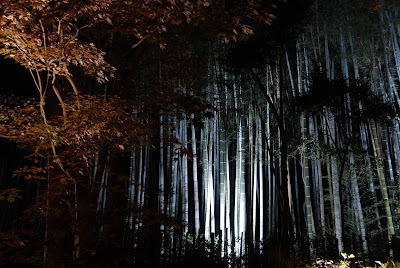 Kyorinbo is noted for it's surrounding bamboo forest, which when lit up contrasts well with the maple trees. If you're headed there for the lightup, I recommend you take some warm gear because it does get pretty cold. The main building has a washitsu • 和室 facing the garden, and the staff provide heating to warm you up after the circuit of the garden. If you're willing to climb a ladder you can also check out the shrine in the peak of the roof (like, up where the thatch is! ), and who knows how, but someone's managed to get one of those human carried taxis up in there. What the hell are those things called anyway? Credit for the photos goes to my father, who was smart enough to take a tripod and uses his Nikon D200 well. For more information, checkout the website (here). 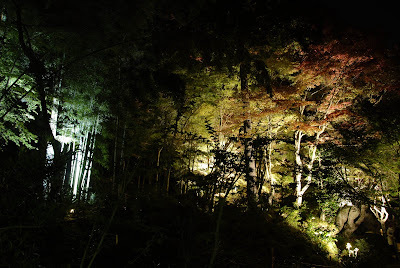 Below is my own photo, and a good example of what happens if you don't have a tripod or a Nikon D200.